2. I read this month's book club read and one other book which both require a good deal of thought. Growing a little tired of editing and re-editing soon-to-come posts, I'm going to stop focusing on those other books and think about pumpkins instead. It should be noted that I like to cook (and bake, which I think is a funny thing to distinguish). I enjoy putting together meals for my family from scratch. Yes, it does take a heaping lot of effort and many hours of planning and preparation but I do believe it is worth it. (Except I really was frustrated when I spent an hour on a meal recently that flopped. Royally frustrating.) You have to be willing to live and learn in the kitchen and not be afraid to experiment. 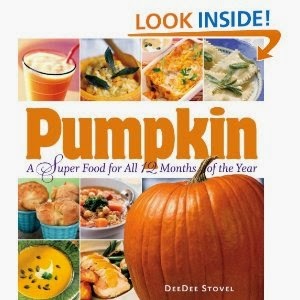 It should also be noted, as part of the introduction to this book, that I was suspicious of pumpkins growing up. I think the only reason that is so is because we only ever ate them in pie. If you don't like pumpkin pie, you probably don't like pumpkins period, right? I (now) say wrong. (Although I do like pumpkin pie, it wasn't my childhood favorite.) I think it was actually Jamba Juice which expanded my pumpkin horizons. Suddenly pumpkin seemed versitle! (If you can put it in a smoothie and make me love it, the chances are that I will love it in other forms as well.) When I saw Pumpkin, a Super Food for All 12 Months of the Year in Storey's line-up, I knew I had to check it out. And oh wow, am I so excited by all of the possibilities contained within the pages of this book. Although I have listed several recipes which specifically mention chicken, I want to point out that Stovel includes recipes for lamb and pork as well. Would I recommend Pumpkin, a Super Food ? In a heartbeat. As I say, the recipes are numerous and ingredient list common. I know I am going to find this book useful and I suspect it would be a great hit with other cooks who also like to think in terms of seasons. Note: it is incredibly cheap (as far as cookbooks go) on Amazon . Many thanks to Storey publishers for sending a copy of this book my direction in order to facilitate this review. I received no additional compensation and all opinions are 100% my own. I want to know about this pumpkin cornbread. Stat. So far I have never tried a spiced pumpkin latte - the thought of pumpkin flavor in liquid form is a little nauseating to me. Maybe the next time a friend or loved one has one in my presence I'll ask if they could pour off a little bit so I can see what it is like (although recently a friend looked up the ingredients of well-known coffee place's pumpkin lattes and found there was no pumpkin in it at all - only flavoring). Today we made the pumpkin cornbread. It tastes so good it could be cake. You could eat ice cream with it. You have me totally intrigued. I'm going to look for it at the library. I made my own pumpkin latte cream this thanksgiving. It wasn't too bad. And may I just say there is definitely a distinction between cooking and baking in my world. I love to cook, baking definitely not so much. This book sounds amazing!! I love pumpkin anything!! Though I'd like to know how she gets pumpkins year round. Does she use canned pumpkin? Because I can't get fresh pumpkins until October and only for a couple of months. :( I wish they were accessible all year!